There are many shrine and temple markets throughout Japan, often being held on just one day of the month. The Tenjin-san Market is not only one of the largest in Kyoto, but also in the Kansai area. Hosting over 1,000 stalls, something is sure to pique your interest! 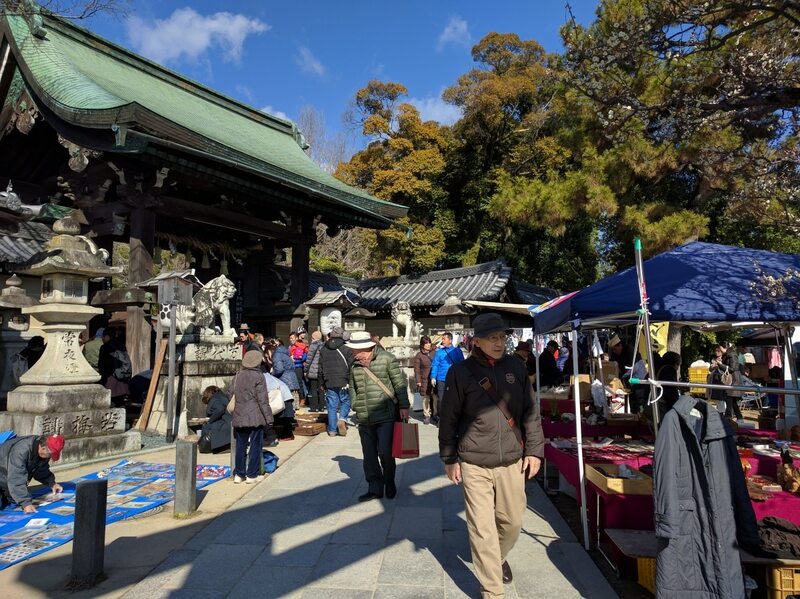 If you're in Kyoto when the market is open, definitely check it out! 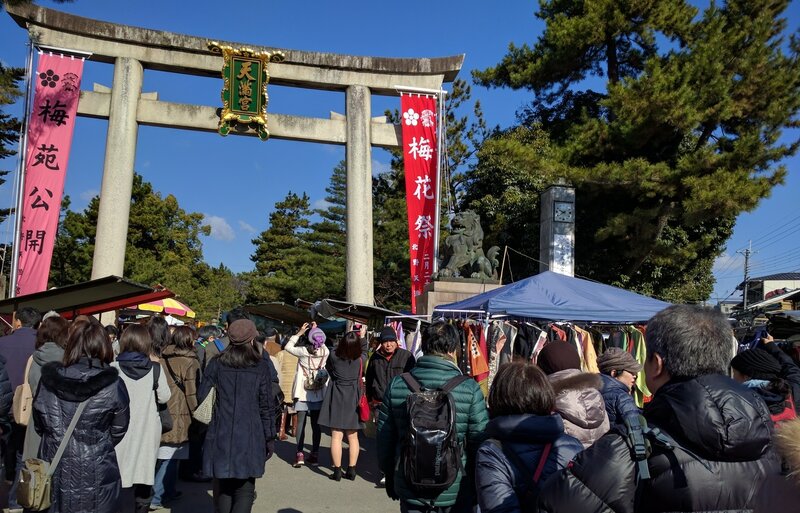 Held at Kitano Tenmangu Shrine (北野天満宮) in northwestern Kyoto, the monthly market attracts stalls selling a variety of goods, most famously fabrics and kimono. On almost every street, there are at least two stores with racks of fabrics, plus the scores of other items, including teas, vintage items and fine woodworking. The market sprawls throughout not only the shrine entrance, but also the surrounding streets. Just when you think you've reached the border of the market and found the regular streets, you'll discover an extra section jutting out with even more interesting goods. Of course, no shrine market (or festival!) is complete without food, and Tenjin-san is no exception. They have the usual fare, including yakisoba (fried noodles), but also offer freshly grilled corn on the cob, fried chicken and a large variety of candied fruits, including pineapples and kiwi. The monthly event marks the date of the birth (and, coincidentally, death) of Sugawara no Michizane, a prominent poet and statesman of the Heian Period (794-1185). Kyoto was beset with a series of natural disasters after he died in exile in 903, and Kitano Tenmangu Shrine was built to appease his spirit. He is now revered as Tenjin, the Shinto god of learning. When: The Tenjin-san Market is open on the 25th of every month starting at 6:00 a.m. and lasting until 4:00 p.m.
1. From within Kyoto, take the Keifuku Dentetsu-Kitano Line to Kitano Hakubaicho Station. It's a five-minute walk from the station, following the main road. 2. From JR Kyoto Station, take city bus #50 or #101 to Kitano Tenmangu-Mae. This will put your right at the entrance. 3. Alternatively, you can skip JR Kyoto Station and take the Hankyu-Kyoto Line to Saiin Station, then take bus #203 to the entrance. At the time of this writing, Kyoto city buses have a flat rate of ¥220 yen. The shrine is also less than 10 minutes' walk from Kinkaku-ji, a key stop on any Kyoto tour.